The Scribbles Club along with their sponsor and teacher, Sandra San Miguel. A club from Hidalgo ISD’s Ida Diaz Jr. High has been helping the community for several years. 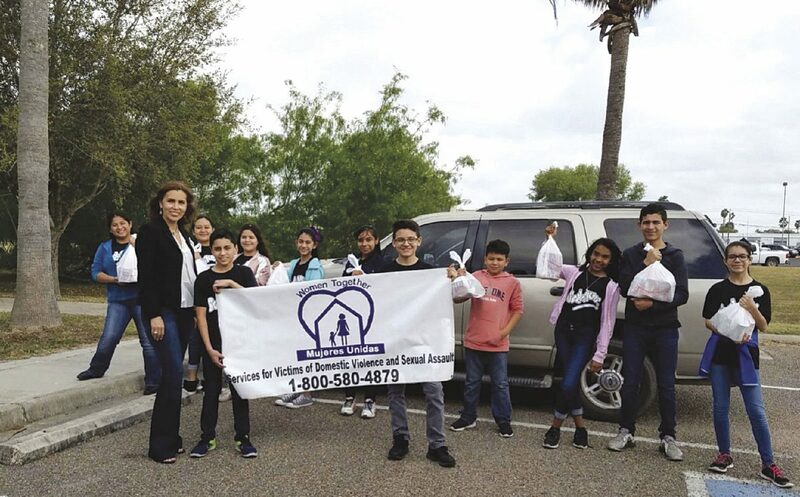 The Scribbles Club, along with its sponsor and teacher Sandra San Miguel, has been donating items to Mujeres Unidas. The club, which is for the English language arts for speakers of other languages, was started 15 years ago to help her Spanish-speaking students. Through the club, she’s taught them the importance of helping their community. “If there is anything they learn from their experience it’s to help the community or others in need,” San Miguel said. Each year, students collect different items such as gently used clothes, school supplies, canned food and toiletries. For Christmas, they collect money to buy toys for children. San Miguel said she choose Mujeres Unidas because of the help it provides to local women. Recently, the club donated clothing, and canned goods to the organization. Abigail Vargas, a 7th grader and club secretary, said she enjoys helping her community. Vargas wants to become a teacher who teaches English to students who grew up speaking a different language, similar to San Miguel.